So, MIT has this weird tradition. About 3.14 years after graduation, we reconvene in Las Vegas for an event called Pi Reunion. The Pi Reunion for my graduating class was held a few weeks ago, and I managed to take some pictures. After an early 4:00 am start to the morning, our coalition of 14 (including Adi) amassed at the check-in area, and then headed to the gate. The trip itself began with a technicolor dreamflight during which most of us caught up on sleep. Apparently this color scheme is typical for Virgin America, but this was my first time seeing it. Above, the captain tells us how short our naps will be before the crew prepare for departure. I really enjoyed the diverse and sometimes plain weird decorations during our trip. 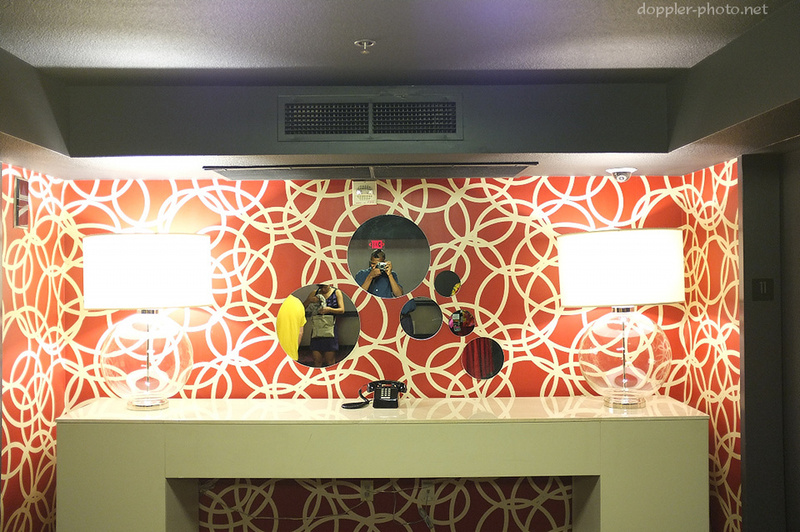 We stayed at Planet Hollywood, which was apparently circle-themed, with a side of vibrant (or sometimes garish) colors. There were circles on the carpets, circles on the wallpaper, spherical lamps with cylindrical lampshades, and circular mirrors to boot. Given all those circles, the plain, straight edges of the white table seemed a tiny bit out-of-place, but at the same time a little bit refreshing. The stark black telephone made for a little bit of linear and chromatic symmetry that was lacking elsewhere. The following day, a subset of our troupe escaped the glaring lights and aggressive "hot girls" marketers of The Strip with a night journey to Old Las Vegas. It felt a little bit like an oasis of reality in the wonderland of debauchery that is Vegas. If The Strip is a tourist trap (which it is), then Old Las Vegas was at least part-way to "hole in the wall" status — there were still plenty of tourists and visitors, but it no longer felt like someone was trying to make money off of us at every turn. Above, my friend Amy tries to call after a couple minutes spent fruitlessly waiting for one to pass — something that would never happen on The Strip. We ended up flagging one down and having a nice chat with the cabbie, a 14-year Las Vegas resident, on the way back to our hotel. 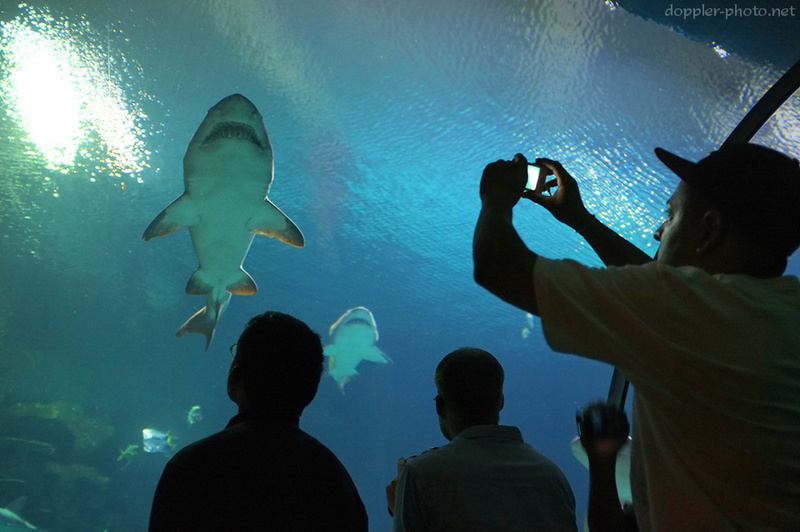 On the final day of our trip, we scrubbed plans to drive to Rachel (just outside of Area 51) or the Hoover Dam and instead opted for a non-driving excursion to the Mandalay Bay hotel's Shark Reef aquarium. The aquarium was great for watching the animals both on the far side of the glass and the near. The sharks, giant turtles, rays, komodo dragons, and other varieties of unfamiliar animal seemed to awaken a deep-seated sense of wonder in people that at times seems to be all but missing. Click here to check out the rest of the photos from our trip. 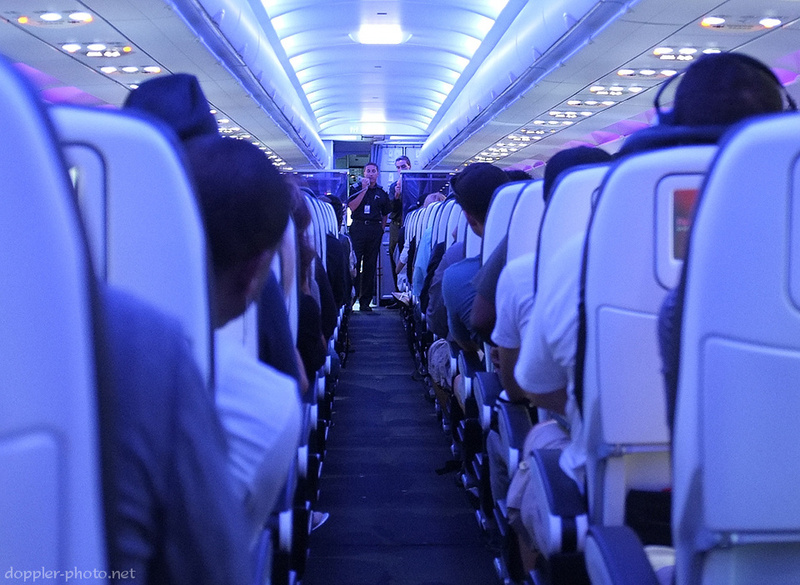 The first picture in the airplane has an eerie 2001 Space Odyssey feel because of the lighting. I expect someone to drop a pen and have it float, slowly rotating in the air. I think I lose half of my geek cred every time I admit that I haven't seen a classic like 2001 Space Odyssey.